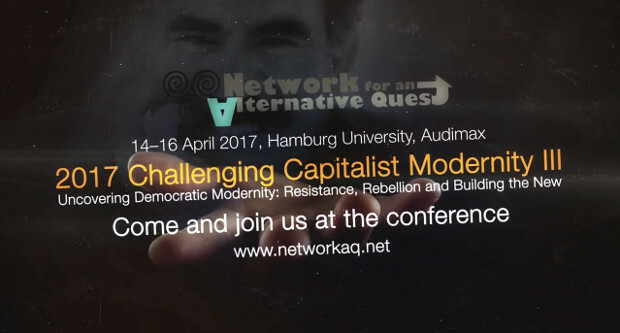 The conference “Challenging Capitalist Modernity III: Uncovering Democratic Modernity – Resistance, Rebellion and Building the New” will be held on Hamburg of Germany. This conference will take place on the Easter weekend 14-16 April 2017. Network for an Alternative Quest are organizing the conference. There has been two past conferences “Challenging Capitalist Modernity I: Al- ternative Concepts and the Kurdish Case” in 2012, “Challenging Capitalist Modernity II: Dissecting Capitalist Modernity – Building Democratic Confederalism” in 2015. Network for an Alternative Quest, the organizer of the conference published an invitation on their official web site, which we publish part of that. “For three days hundreds of students, intellectuals, activists and movements came together and discussed not only what they criticized, but also how and what they wanted to be. Many ideas from around the world and that of the Kurdish freedom movement came together to strengthen their practices. In this third conference we will continue to focus on the critique of the capitalist modernity, but this year we will discuss the obstacles and how these obstacles can be overcome. us, the main theme of this year’s conference is the importance of being organized and to be in solidarity. Capitalism is stuck in a structural crisis and losing legitimacy worldwide ― despite the claim that no alternatives exist. At the same time right-wing and reactionary movements o er themselves as alternatives. But there are other ways than the seemingly only alternatives. In Rojava/North Syria it was possible not only to not take sides but to establish an own, “third way”. The building of a non-patriarchal system and a democratic economic order seems within reach and has the chance to establish itself permanently. The past two conferences brought together not only leading intellectuals, but also gave young activists, students and scholars a chance to present their ideas. In this third conference we want to once again build bridges between all these and movements in Kurdistan and worldwide. For more information and register for conference please visit conference official web site at www.networkaq.net.